Spectromatch is one of the world’s foremost experts in skin colour measurement, analysis and matching for prosthetic applications. Spectromatch patented technologies provide the most advanced and accurate systems for skin colour matching currently available. 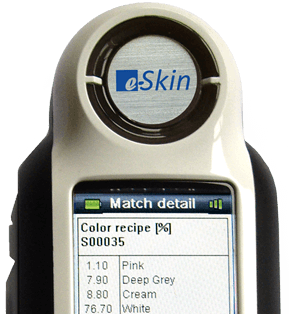 Spectromatch technologies enable the user to take digital skin colour measurements and automatically create bespoke matching pigment recipes. Our silicone colourants are manufactured in-house from the best quality pigments to the highest clinical standards. derma-sil gum silicones have been created specifically for the manufacture of custom cosmeses and are easy to sculpt and blend. Colouring silicone to match a patient’s skin tone remains one of the most challenging aspects of silicone prosthetics. There are numerous optical factors that dictate the colour matching process and this makes the relationship between colouration and the resulting colour complex. This paper aims to explain these effects based on sound scientific principles to inform your clinical practice. The long term colour stability of pigments has been well studied but as artists continue to explore different ways of producing works of art and have as a consequence adopted materials that have not necessarily been evaluated with long term stability in mind. The purpose of this study is to compare the colour stability of the generic FX pigments currently used by Mueck with those produced by Spectromatch Ltd.
e-skin allows all members of the team to achieve accurate, reproducible skin colours in seconds. The patient benefits from quicker appointments and consistently natural looking prostheses. The Reality Series Silicones have dramatically increased the colour stability of our facial prostheses, our prostheses now last 50% longer while reducing patient treatment time and improving prosthetic outcomes and reproducibility. I LOVE e-Skin! The colors are spot on, and the system allows for exact duplication. It takes all the guess work out of my base color, takes all the worry out of color choices on cloudy days, and best of all, gets me home in time for dinner! Using Spectromatch technologies results in non-metameric prostheses that will match patient's skin colour in all lighting conditions.